NTIS Accession No. of the report covered in this TechBrief: PB2014-103454. The objective of this research was to determine the lap splice length of untensioned prestressing strand in field-cast ultra-high performance concrete (UHPC). The development length of reinforcements embedded into UHPC can be significantly shorter than the lengths normally associated with conventional concrete. Shortening the development length of prestressing strand can allow for a redesign of some structural systems, including spliced girder and continuous-for-live-load bridges. UHPC, when used in field-cast connections between prefabricated bridge elements, can create robust connections that emulate monolithic components. Connecting adjacent pretensioned elements to one another affords the opportunity to increase the efficiency of the structural design, accelerate the construction, and enhance the serviceability of the structure. Connections engaging prestressing strands extending from the components are rarely designed or implemented due to the need for expensive mechanical connectors or long lengths of strand (and thus geometrically large connections). Critical connections in which splicing of existing strands might have been appropriate have traditionally been completed using either post-tensioning systems or supplemental mild steel reinforcement. UHPC-class materials have been demonstrated to significantly decrease the development length of embedded reinforcing elements. As such, UHPC may afford a new opportunity to reconsider the traditional methods for connecting prestressed elements, including the splicing of prestressing strands. It may be possible to reduce the embedment length of prestressing strands to the point that splicing of pretensioned elements becomes a viable design concept and construction technique. Most notably, this concept could advance the state-of-the-practice for multispan continuous structures and for spliced girder structures. This study investigated the development length of 0.5- and 0.6-inch (12.7- and 15.2-mm) diameter untensioned prestressing strands embedded in steel fiber and polyvinyl alcohol (PVA) fiber reinforced UHPC. The volumetric fiber content was 2 percent. The compressive strength of the steel fiber reinforced UHPC at the time of strand splice testing was approximately 23.5 ksi (162 MPa). As is common when reduced stiffness fibers are used in UHPC, the compressive strength of the PVA fiber reinforced UHPC was reduced to a value of approximately 19.5 ksi (134 MPa). A development length test was designed that allowed for the replication of the tension— tension stress state that could occur when two strands were lap spliced within a connection between two linear elements. The specimen geometry and test setup are shown in figure 1. The non-contact lap lengths tested ranged from 8 to 24 inches (20.3 to 61.0 cm) for the 0.5- and 0.6-inch (12.7- and 15.2-mm) diameter prestressing strands embedded in steel fiber reinforced UHPC. The non-contact lap lengths ranged from 8 to 36 inches (20.3 to 91.4 cm) for the 0.5-inch (12.7-mm) diameter prestressing strands embedded in the PVA fiber reinforced UHPC. Specimens were cast and cured in an ambient laboratory environment. Figure 2 shows the casting of 1 of the 18 test specimens. 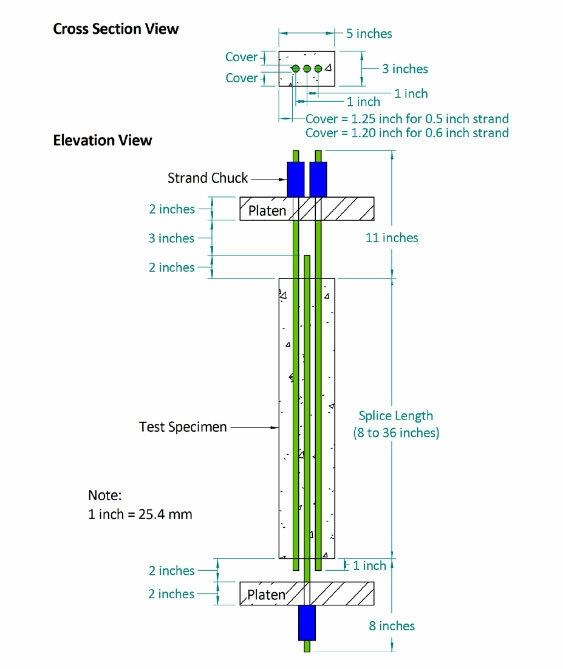 The tests were completed under displacement control in a servo-hydraulic testing machine as shown in figure 3. The load resisted by the specimen and the slippage of the dead end of the single prestressing strand were captured throughout each test. Tests were continued until well after the peak resistance was achieved or until the strand ruptured. Each test was completed between 28 and 32 days after casting of the UHPC. Figure 1. Test specimen geometry and loading setup. The implemented test method proved capable of demonstrating the different behaviors that could be exhibited by unstressed prestressing strands embedded into field-cast UHPC. Longer embedment lengths correlated with higher strand stresses at peak resistance. Figure 4 provides the test results with the nominal strand strength of 270 ksi (1,860 MPa) shown as a dotted line. The three types of specimens are shown with the range of embedment lengths tested. The behavior of each specimen can be described as follows. Initially, the response appeared elastic, with the single strand effectively transferring all applied load through the UHPC into the lapped strands. If the lap length was long enough, transverse tensile cracks appeared in the UHPC. Next, most specimens began to exhibit splitting cracks that began at the loaded end of the single strand and ran along the length of the specimen. In nearly all cases, this crack eventually extended along the entire length of the specimen, resulting in a loss of confinement of the strand and a reduced resistance to continued loading. In two cases with the 0.5-inch (12.7-mm) diameter strand and longer embedment lengths in the steel fiber reinforced UHPC, the prestressing strands ruptured prior to the generation of a full-length splitting crack. Visual observations during and after the tests indicate that the steel fiber-reinforced UHPC specimens exhibited tighter cracks, in particular, the splitting crack that tended to run the length of the specimen immediately prior to the attainment of peak resistance. Cracks in the PVA fiber reinforced specimens were wider. This is likely due to the lower elastic modulus of the PVA fibers, resulting in a reduced crack opening stiffness. The PVA specimens would then generate less clamping force on the strands and thus, as observed, would require a long embedment length to fully develop the strand. Figure 3. Test specimen in load frame. Figure 4. Peak strand stress versus lap splice length. The objective of this research was to determine the lap splice length of untensioned prestressing strand in field-cast UHPC. The results suggest that, for the steel fiber reinforced UHPC, the 0.5-inch (12.7-mm) diameter strands can be fully developed within 20 inches (0.51 m), and the 0.6-inch (15.2-mm) diameter strands can be fully developed in approximately 24 inches (0.61 m). The 0.5-inch (12.7-mm) diameter strands can be fully developed in the PVA fiber reinforced UHPC in approximately 36 inches (0.91 m). In all cases, greater or lesser confinement of the strands would result in changes in the development length. Confinement parameters of interest include cover; fiber reinforcement type, volume, and efficiency; passive transverse reinforcement; and concrete tensile response. 1. Graybeal, B., (2011). Ultra-High Performance Concrete, Report No. FHWA-HRT-11-038, Federal Highway Administration, Department of Transportation, McLean, VA.
2. Graybeal, B., (2012). 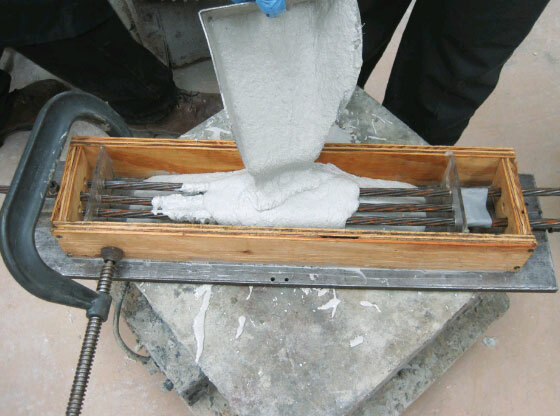 Construction of Field- Cast Ultra-High Performance Concrete Connections, Report No. FHWA-HRT-12-038, Federal Highway Administration, Department of Transportation, McLean, VA.
3. Russell, H., and Graybeal, B. (2013). 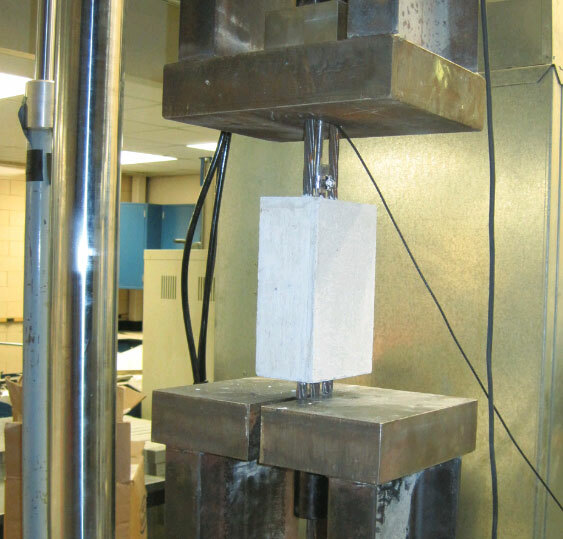 Ultra- High Performance Concrete: A State-of- the-Art Report for the Bridge Community, Report No. FHWA-HRT-13-060, Federal Highway Administration, Department of Transportation, McLean, VA.
Researchers—This study was conducted by Ben Graybeal at FHWA’s Turner-Fairbank Highway Research Center. For additional information, contact Ben Graybeal at (202) 493-3122 or in the FHWA Office of Infrastructure Research and Development located at 6300 Georgetown Pike, McLean, VA, 22101-2296. Distribution—The report (PB2014-103454) covered in this TechBrief is being distributed through the National Technical Information Service at www.ntis.gov. Key Words—Ultra-high performance concrete, UHPC, fiber-reinforced concrete, prestressing strand, development length, bond stress.